Intent-based Networking. Is it real? Are you ready? Intent-based networking is generating interest as a next-generation method for automating network changes and validating network policies. What's really feasible today, what benefits does it offer and where can it be deployed? We will show how it can be used to verify network designs and configurations in a fraction of the time. And it's easily deployed today. Forward Networks unveils its latest feature enhancement, Behavior Diffs, allowing analysis and comparison of network behavior and configurations between points in time. It provides a powerful tool for isolating network issues and checking policies before and after change windows. Includes a 6-minute demo, and is a good introduction to the Forward Enterprise platform overall. Automation + Verification: Learn why automating network processes is only part of the battle. Organizations need a network verification platform to check manual and orchestration-driven network updates in large agile environments to reduce the possibility of outages and configuration errors. Forward Networks verification platform is an ideal complement to Cisco Network Services Orchestrator (NSO, originally Tail-f) as we show how orchestration changes can be verified for policy compliance in real-time as changes are pushed out. It is now possible to proactively verify large enterprise networks are error-free, end-to-end. Network verification makes it possible to certify updates before pushing them live, to avoid outages and accelerate change windows. Join Forward Networks Co-Founder Nikhil Handigol to learn how this new network analysis technology can greatly simplify network IT and ensure 100% policy compliance. Includes a live demo. Forward Networks use case video: Learn to isolate network faults by analyzing historical configuration changes and rolling back to known good states. Accelerate troubleshooting and remediation processes and avoid network outages with the highly scalable Forward Enterprise solution. Forward Networks use case: Verify the impact of network configuration changes during change windows before pushing live. Accelerate testing and review processes for network changes to shorten change windows and get network updates deployed faster. Reduce labor intensive tasks to review and test proposed changes and avoid errors and outages. Forward Networks use case: Understand network policies and behavior by analyzing traffic paths end to end. Accelerate isolation of configuration errors and remediation in a few simple steps. Forward Enterprise is a straightforward tool to ensure that network designs match policy intent. Forward Networks use case video: Use pre-defined checks to verify network configurations and eliminate basic configuration errors such as VLAN inconsistencies, forwarding loops, MTU settings and more. Intent Based Networking is a rapidly emerging analytics and automation capability for modern data center networks. Learn how the Forward Networks platform, a leading IBN solution, verifies network intent, i.e., is my network doing what we intend and aligned with all our policies. Customers can now reduce network outages and security risk, while gaining deeper analytical insight to network behavior than possible with traditional approaches. 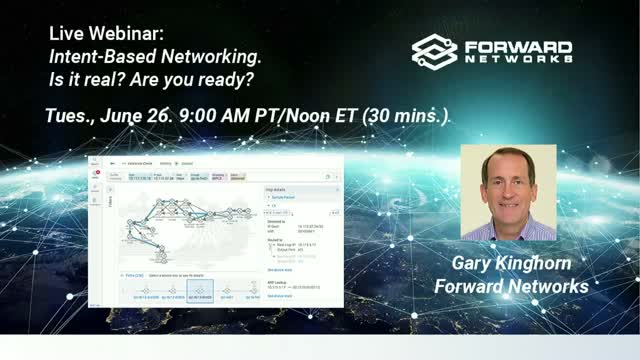 Forward Networks is a leader in network analytics and intent-based networking solutions. Our BrightTALK channel focuses on the technology, marketing and solutions in this rapidly evolving space. Title: Intent-based Networking. Is it real? Are you ready?